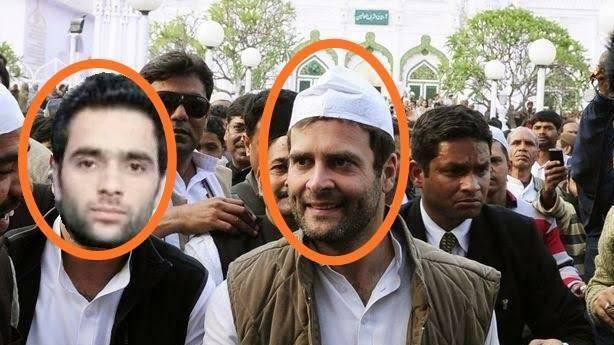 New Delhi: As India reels from the attack in Pulwama that killed at least 40 CRPF personnel, a fake photo showing Congress president Rahul Gandhi with the suicide bomber Adil Ahmad Dar is going viral on social media. The photo is also being shared on social media platforms Facebook and Twitter. However, it is a morphed version of an image from February 2014. The actual image showed Gandhi sporting a skull cap outside a masjid ahead of the party’s campaign for the 2014 Lok Sabha elections. It was captured after he reportedly paid “obeisance at the dargah of renowned Sufi saint Haji Waris Ali Shah” on 28 February 2014 and kicked off a roadshow in Uttar Pradesh’s Barabanki. In the viral photo, the face of the man on Gandhi’s right has been morphed with Dar’s, who rammed an explosives-laden car into a CRPF convoy in Jammu and Kashmir’s Pulwama district Thursday. The image clearly attempts to link the Congress and Gandhi to the suicide attack in Kashmir that has been claimed by Pakistan-based Jaish-e-Mohammed. This also comes after another viral video Thursday showed Congress’ eastern Uttar Pradesh in-charge Priyanka Gandhi Vadra laughing in the wake of the attack. The video was reportedly cropped in order to create a false impression. On Friday, Gandhi affirmed the Congress’ support to the Bharatiya Janata Party-led government and Indian soldiers in the wake of the attack. He firmly shut down any questions regarding politicising the issue at a press conference.